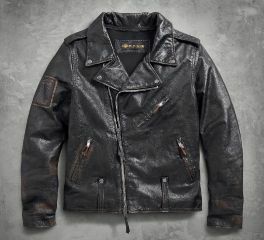 Sometimes only genuine leather will do, so choose a Harley-Davidson® leather jacket for your casual wardrobe. 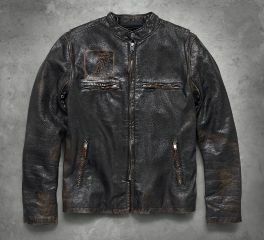 The Digger Slim Fit Leather Jacket boasts a vintage patina thanks to the washed and rubbed leather. Grubby patches add to the mystique of this gear that borrows the silhouette of a favorite denim jacket. Flip it over for the epic laser-etched graphics on this men's leather motorcycle jacket. Stay Warm: Quilted lining adds warmth. Pockets: Snap hand-warmer pockets and button flap chest pockets. One interior stash pocket. Design Details: Washed and tumble-dried leather with rub-off finish for vintage look. Action back. Snap-down collar. Button waist tabs. Graphics: Dirty, distressed embroidered patches. Laser-etched graphics. 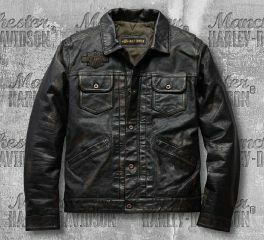 This Men's Black Double Ton Slim Fit Leather Jacket is embossed with Harley-Davidson® lettering on front, two vertical zipper pockets, and metal badge on upper left chest. 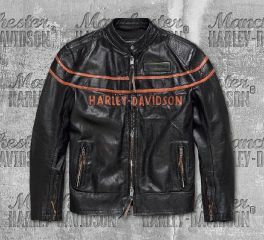 Finished with embossed number "1 Harley-Davidson®" on the back. Lightweight cowhide leather with wax finish is washed, tumble dried, and hand sanded for distressed, vintage look. Cotton twill body lining and polyester taffeta sleeve lining. Underarm grommets. One horizontal interior pocket. Highly detailed laser-etched graphics on right chest. Dirty, distressed embroidered patch on back waist. Every jacket is one of a kind with unique treatments, graphics, and natural variations that add character. The inspiration behind our Master Distressed Slim Fit Leather Biker Jacket is no secret. The iconic Biker Jacket silhouette, seen in countless archived images, spawned this re-creation. The natural breaks and distressed details on the lightweight cowhide leather are rendered by hand. Precise, laser-etched graphics combine with a dirty, vintage patch positioned on the back waist of this men's leather motorcycle jacket. Features a Slim Fit that is narrower throughout.